Here I go with the last shooting and article about my weekend in style at the Royal Savoy. Just before leaving, I decided to shoot outside in front of the hotel. I was taking some pictures with my HelloKitty polaroid, received for my latest 23rd birthday… Ahahah I know what you must think, really still into HelloKitty at this age… this must be her Asian side. Seriously I love all these kind of cute pink gadget, haven’t you seen my iPhone case? 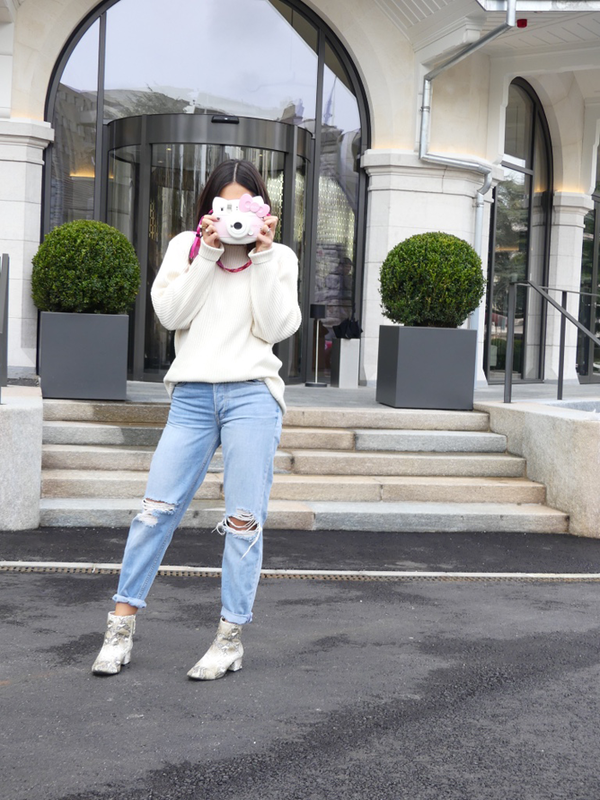 The ripped jeans are from TopShop, but if you have read some previous posts you would know that I participated in a market and that I sold some of my clothes and accessories. My best friend Eva came with me and we were checking what we would sell, when I saw these amazing trousers. I couldn’t let this pair go. So, we swapped, jeans against jeans. Swapping feels even better, cause luckily you exchange a piece of yours against something that you really want! I was searching for jeans like these, but could not find some fitting ones. If your BFF sizes the same as you, it’s definitely the best thing to check her closet and organise some swap deals ;). A perfect weekend, three outfits, delicious food and a great location, couldn’t be happier!